A walk in Teesdale from the village of Eggleston up on to Grey Carrs before returning via the head of Langleydale and a stretch of the Teesdale Way. The walk finished with an optional visit to Eggleston Hall Gardens. There are just a handful of hills over 400m in the North Pennines that I’ve not been up yet. 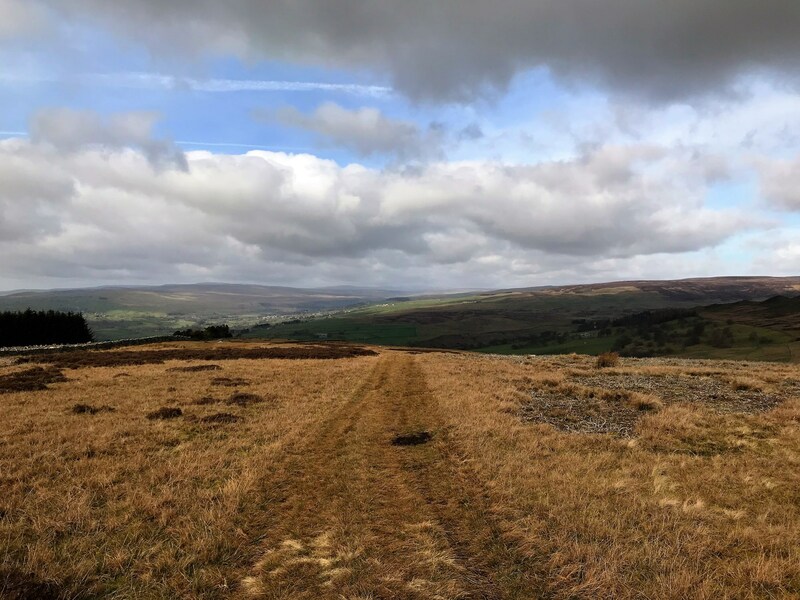 The aim of this walk was to bag one of them – Grey Carrs, the highest point on Eggleston Moor. This was the first proper walk I’d been out on for a few weeks. During this time my camera had been away for repair and this, combined with indifferent weather and other commitments had stopped me going out. Frustratingly my camera had not yet come back so instead I had to make do with the camera on my mobile phone. I parked the car on the roadside in Eggleston between the church and the Three Tuns Inn. Walking up past the pub I crossed over the road to Stanhope, turned left past the village hall and then took a path climbing up through a field on my right. After slanting through the next pasture I then cut up the next one which was full of newly arrived lapwings. I then passed through what seemed to be the garden of Middle Nemour to reach a minor road. Turning right I climbed up to the road end next to the empty looking house at High Nemour. Nemour Hall to the left also looked fairly derelict. Passing through a gate a good track then zig-zagged up alongside a plantation on to the moor above. Already the views were very fine. Looking back over Eggleston and Mickleton I could see Grassholme Reservoir with Mickle Fell set further back. To the north-west I could also make out the faint outline of Meldon Hill, the two Dun Fells and Cross Fell. Following the bridleway east I continued until just below the 450m contour line before making a beeline for the summit. Although it is labelled as Grey Carrs on the OS map and Database of British Hills the Ordnance Survey trig point which is situated on the highest point is recorded as Eggleston Moor on the OS database. The trig point was surrounded by several stones one of which had an older benchmark pointing at a hole in a rock which looked like it might have once held a bolt or rivet. The view was excellent, much better than I had perhaps anticipated. Including the hills already mentioned it also included some of the north Dales fells, including Rogan’s Seat. More distantly I thought I could pick out Nine Standards Rigg. To the east meanwhile the ground dropped down to Hamsterley Forest with much of County Durham beyond. After spending a while taking photos I made my way back to the bridleway. Continuing east I passed through a gate to leave the track for a section of rougher moorland walking. My intention had been to follow the wall south-west. I soon made a detour though to visit a small stone building sitting on top of Hutchinson Spring. There was quite a loud and slightly unnerving swooshing sound coming from within. Returning to the wall I climbed gradually up to Death Nook. The name fairly suited the place. On the other side of the wall most of the trees had been chopped down. I then nearly caught my foot in a rabbit snare before coming across the body of a seagull. It was very odd, the body was very well preserved and looked quite fresh. There was no sign however of the neck and head. Very strange! Over the next bump I then dropped down into Adders’ Gill. Now I’ve not yet seen an adder and given the name of the place I had high hopes that I might finally see one. I was destined to be disappointed though and after crossing a reedy bog I climbed up to a broken wood gate. Climbing over I then followed the fence until it joined a track leading out on to B6282. Crossing straight over I then took the drive towards Holdsworth Farm before dropping down into the shapely valley head of Langleydale. Climbing up the steep bank on the other side I then took a path near some shallow quarry workings to reach the B6279. Turning right a short distance I then took the drive to the house at Windy Hill. The path curved around the back of the farm before fading. Crossing two more fields I then reached another road. Crossing over I then walked down the tree-lined drive to High Shipley. Before reaching the farm I located a stone step stile on my right to cross some sheep pastures. The path crossed over Raygill Beck just above a waterfall. After a lot of rain it must look quite impressive but for the most part the stream is just a trickle, barely able to get round the tree root at the top of the waterfall. Coming to a brow I suddenly had an excellent view up Teesdale towards Middleton. Dropping down to the farm at East Barnley I then joined the Teesdale Way. The final section of the walk followed the Teesdale Way as it dropped down through some woods to reach a road. After a brief detour left to eat my lunch by the river I then walked up the track to Eggleston Bridge. Turning right up the roadside I passed a couple of waterfalls before turning left down the drive to Eggleston Hall Gardens. The voluntary £2.50 entry fee was worth it just to visit the hidden remains of the ruined 17th century chapel. After looking around and purchasing some primroses for my wife I then took the right of way up to a road junction. Crossing straight over it was then a simple walk back up alongside the more modern church and back to the car. All in all this was an enjoyable walk. The views from Grey Carrs, and indeed from other points of the walk were excellent. For the most part the paths were easy, the main exception being the pathless mile or so from the bridleway on Eggleston Moor to Adders’ Gill. Eggleston Hall Gardens was a little bonus at the end. Meanwhile I’ll have to go back with a proper camera at some point to get a better picture of the fine waterfall opposite the entrance to the gardens.